The event was organized by the Holodomor Research and Education Consortium of the Canadian Institute of Ukrainian Studies (Toronto office), University of Alberta; the Petro Jacyk Program for the Study of Ukraine; the Canadian Foundation for Ukrainian Studies; and the Centre for Russian and East European Studies at the University of Toronto. Ms. Applebaum writes on history and politics in Eastern Europe, Ukraine, and Russia and is a columnist for The Washington Post. Her book Gulag: A History won the Pulitzer Prize for non-fiction in 2004. Her most recent book, Iron Curtain: The Crushing of Eastern Europe, 1944–1956, won a number of prestigious prizes, including an Arthur Ross Silver Medal from the Council on Foreign Relations and the Cundill Prize for Historical Literature. She is currently writing a book on the Holodomor. Stalin learned not only from successes but from failures as well, the most significant being the civil war in Ukraine. He knew first hand of the two failed attempts by the Bolsheviks in Ukraine, having served as Lenin’s representative there. Armed groups had been sent into villages to collect grain “owed” to the state, a method that fueled resentment, a massive peasant rebellion and a counter revolution that in 1919 came close to succeeding. Ms. Applebaum asserted that this close call was long remembered by communist officials. “The prevention of another Ukrainian peasant uprising was absolutely at the center of their concerns,” she said. Losing Ukraine was unthinkable, and Stalin turned to the kind of extreme repressions he had deployed in Tsaritsyn. Soldiers were sent to villages to confiscate not only grain but vegetables, fruit and livestock. “By the spring of 1933 whole villages had fallen silent as every single one of their inhabitants starved to death,” she said. To turn Ukraine into a Soviet “fortress” entailed targeting not only the rural population but also the Ukrainian language and culture. A legacy of these policies is that many Russians were convinced that Ukraine was not a real nation and was not significantly different than Russia, Ms. Applebaum said. Turning to Putin, Ms. Applebaum suggested that Ukraine represents an existential threat for the Russian president, as it had for Stalin before him. According to Ms. Applebaum, Stalin understood that Ukraine, with a population suspicious of centralized authority and attached to its land and traditions, was different than Russia. Putin, on the other hand, is afraid because a country he sees as indistinguishable from Russia is promoting ideas of freedom, democracy, and the West. “If Stalin feared that Ukrainian nationalism could bring down the Soviet regime, Putin fears that Ukraine’s example could bring down his own regime, a modern autocratic kleptocracy,” she said. Ms. Applebaum ended by noting that the trouble for Ukraine is that Russian leaders see it as a factor not in their external diplomacy, but in their internal politics. Putin, like Stalin before him, fears revolution in Ukraine because it could threaten not only Russia, but his own political survival. In 1989 when Putin he was a young KGB officer posted to East Germany, he saw terrified KGB and Stasi colleagues burning their files. He watch with horror as crowds filled the streets, instigated, he believed, by forces in the West. These were formative and cautionary events for Putin just as the civil war in Ukraine had been for Stalin. Ms. Applebaum spoke of Putin’s perfection of “managed democracy,” which includes the creation of fake political parties and state-managed “civil society organizations” to create the impression of pluralism and democracy. “The result is a system that appears to lend legitimacy to the ruling clique but which never allows it to be actually threatened,” she said. Such methods never entirely worked in Ukraine. When In 2004, elections results were falsified in favor of presidential candidate Yanukovych, the Orange Revolution erupted. As in Dresden in 1989, Putin saw “his” people –pro-Russian politicians funded by Russia and controlled by Russian security officers – threatened by democratic forces. After demonstrations in Moscow in 2011, the Euromaidan revolution of 2014 was even more galling for Putin, given that he had worked to ensure that no “color revolution” could take place in Russia by eliminating independent media and any real Russian opposition while stepping up the state global information campaigns internally and abroad. Anne Applebaum is a columnist for The Washington Post and Slate who frequently writes on Ukraine, Eastern Europe, and communism. Her most recent book, Iron Curtain: The Crushing of Eastern Europe, 1944–1956, depicts the imposition of Soviet totalitarianism in Central Europe after the Second World War. Iron Curtain won the Cundill Prize for Historical Literature, the Duke of Westminster Medal, and an Arthur Ross Silver Medal from the Council on Foreign Relations and was shortlisted for the National Book Award and Pen/Faulkner Award. Her previous book, Gulag: A History, won the Pulitzer Prize for non-fiction in 2004. The book narrates the history of the Soviet concentration camp system and describes daily life in the Gulag, making extensive use of recently opened Russian archives as well as memoirs and interviews. Gulag has appeared in more than two dozen translations. 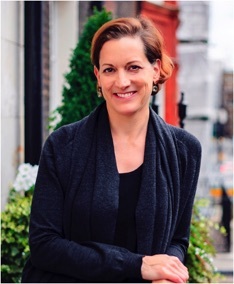 Ms. Applebaum is a former member of The Washington Post editorial board and has worked as the Foreign and Deputy Editor of the Spectator magazine in London, as Political Editor of the Evening Standard, and as a columnist at the Daily and Sunday Telegraphs. In 1988–91 she covered the collapse of communism as Warsaw correspondent for The Economist. She directs the Transitions Forum at the Legatum Institute in London. Her writing has appeared in The New York Review of Books, The Wall Street Journal, Financial Times, The International Herald Tribune, Foreign Affairs, The New Criterion, The New Republic, The National Review, The Independent, The Guardian, Prospect, Commentaire, Die Welt, Cicero, Gazeta Wyborcza, Dziennik, and The Times Literary Supplement. She has also lectured at Yale and Columbia universities; the University of Heidelberg; the University of Zurich; Humboldt University in Berlin; and Lafayette, Davidson, and Williams colleges, among many others. In 2012–13 Anne Applebaum held the Phillipe Roman Chair of History and International Relations at the London School of Economics.